I always wanted a bike with a suicide shifter. It was pretty easy to make. 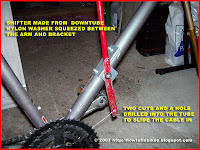 I took a seat tube from a women's frame and cut it. I gave it a slight bend at the bottom. I flattened the end that would bolt to the bracket. I didn't flatten it all the way, you need a little space left so you can slide in the cable and have it move freely to operate. I drilled a hole for the cable and then I made two cuts on the arm to be able to install the cable and then for it to work. I made another hole for the nut and bolt assembly. 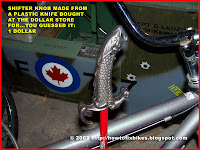 A nylon washer was installed between the shifter arm and the bracket to allow some movement. I finished it off with a knife handle from a toy knife bought at the dollar store for a buck. That's how much money I have put into this project so far, one dollar! My attention was then brought to the seat. I did a crappy job of redoing it some years ago and I was more than willing to screw it up again. I don't really mind since all I want is for it to be comfy and not look half bad. The fabric used was an old black t-shirt. 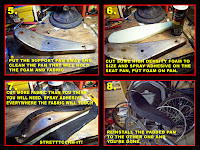 I separated the two seat pans, cut a piece of high density foam to size, sprayed adhesive on the pan, installed the foam on the pan. I then sprayed everything that was going to touch the fabric with that stuff and stretched it on. I then cut away the excess fabric and rejoined both pans together. A word of caution, those tabs are not made to be flexed back and forth too many times. Be careful or they will snap off and you won't be able to reconnect the pans. 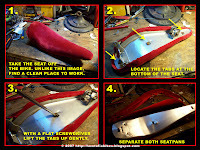 Well, I'm not about to put leather on a Boyd Coddington car anytime soon, but it's clean and it didn't cost me anything. So go get your hands dirty and have some fun. pretty cool, especially the dragon handle. can you tell me why it is called "suicide"? hello, found this site from: selfsufficientfamily.com/. Lots of interesting reading. keep up the good work! 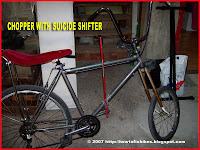 It's called a suicide shifter either because it can hurt you in a crash or because of the fact that you have to remove your hand from the handlebar to operate it, not very ergonomic, but oh so cool! Ann and John, thank you very much. Keep posted for more stuff. haha, thanks for the answer. Great site will send people your way for some really good advise. Great to hear Sue, thank you for your comments. Love the bike. Here's my suggestion: The Green Dart.